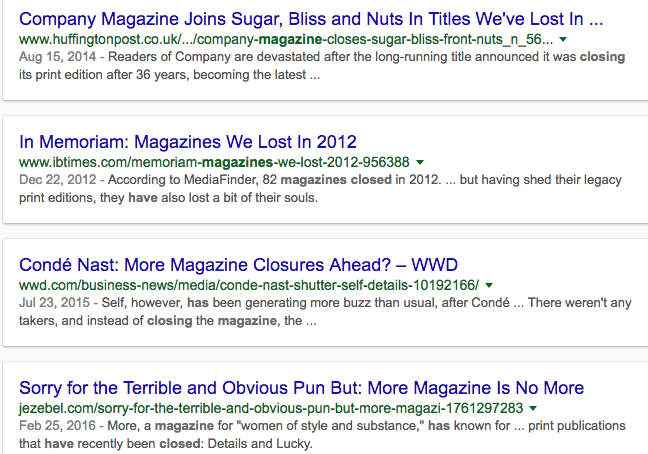 You can find details of the many closures with a simple google. 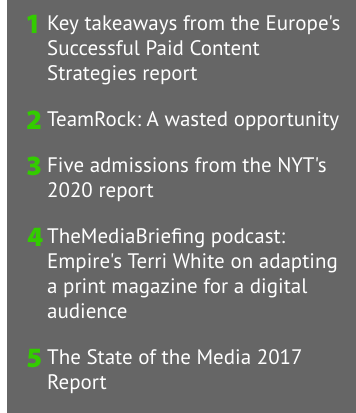 Every media industry has faced massive, often brutal, change as a result of digitisation. New forms of distribution are transforming ways of operating, with new names like Spotify and Netflix rising to threaten the old, established giants. The term used to describe this phenomenon and process is disruption, or digital disruption - the smooth ways of doing business have been challenged, changed ... disrupted. 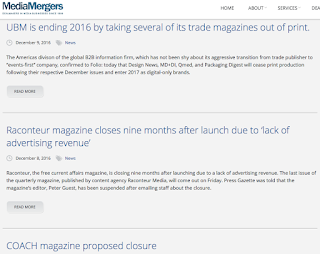 INDUSTRY AWARENESS: Because of the challenge of digitisation (young people preferring screens to print, and advertisers moving online, taking their money away from magazines), many titles have closed recently, unable to survive the double whammy of falling circulation (sales) and loss of advertising revenue*. If you really can't find current, ongoing titles, then you can use titles that were published during this current decade. 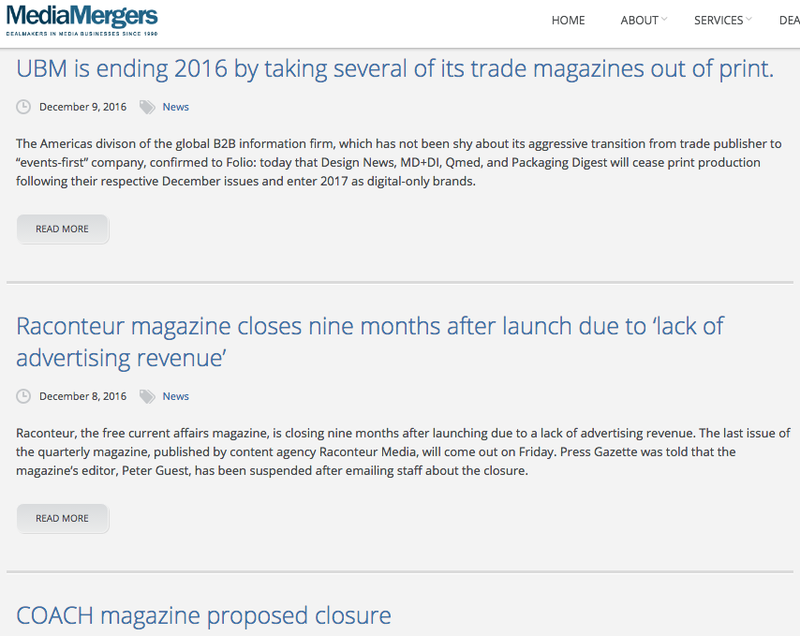 *magazines generally rely more on advertiser fees than the cover price to make money! 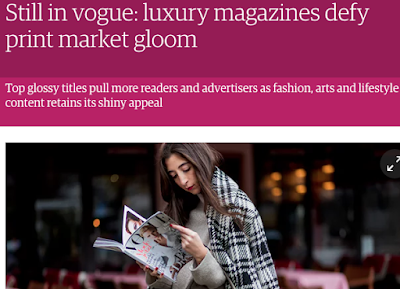 With 100-year-old Vogue and design and lifestyle bible Wallpaper producing their biggest-ever issues – and “handbag” size pioneer Glamour seeking to bulk up to a bigger, glossier edition – the luxury magazines appear to be defying the advertiser and reader exodus rapidly eroding the rest of the magazine market.More than a million British consumers stopped buying print magazines, or gave up their subscription, in the year to the end of June. Titles such as Loaded, Zoo, Nuts, FHM, Company and InStyle have closed or embarked on digital-only reimaginings, while the 64-year-old music bible NME has been forced to go free to find an audience as paying print fans dry up.This is in contrast to the fortunes of the luxury magazine market, which appears resilient to the wider change in consumer reading habits in the digital age. 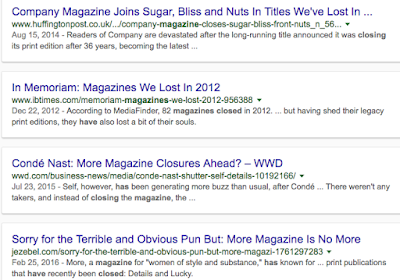 You can find many stories about magazine closures, and the reasons behind this. 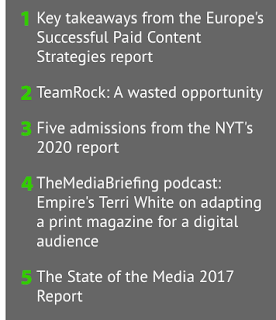 January 2017 saw a bankrupt publisher bought out; as TeamRock disappears, Future becomes a stronger publisher. Thirty-year-old Metal Hammer magazine and stablemates Classic Rock and Prog have been given a new lease of life after being saved from closure by Future Publishing, owner of titles including Guitarist, Total Film and T3.The titles, along with the Golden Gods Awards and the Classic Rock Awards, suspended publication and faced closure after owner TeamRock, which fashioned itself as the self-styled “home of rock and metal”, went into administration in December. 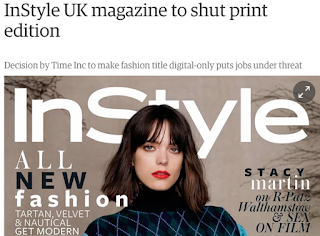 InStyle lost 16% of its circulation in a year, which also meant advertisers wouldn't pay as much to get their ads in the title. 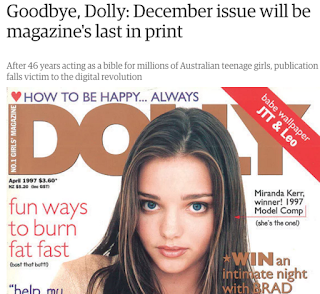 This story about the closure of an Aussie teen girls magazine includes a link for a gallery tracking its covers over 46 years - starting before many of your parents were born! Magazines are not suffering anything like the circulation declines experienced by newspapers, according to one of Britain’s leading magazine chiefs.Nicholas Coleridge, president of Condé Nast International, told a Media Society event earlier this week that although magazine sales were “off their top” it was “only by a small amount”.To prove his point, he listed figures for three of his company’s titles. Vogue, which sold 135,000 copies a month in 1989, is now selling more at 200,000; Tatler has risen from 25,000 to 85-90,000 copies; and GQ is up from 40,000 to 120,000.In addition, said Coleridge, the March issue of Vogue had sold more advertising that any other March issue in its 99-year history.During his on-stage conversation with style writer Peter York at London’s Groucho Club, Coleridge recalled a “futurologist” having predicted 15 years ago that the magazine industry would be completely over within a decade because of “the onslaught of digital”.But he was unsurprised that magazines had held up as a medium by defying “internet erosion”. He said: “There is something extraordinarily alluring about a glossy magazine, the physical quality, particularly a very thick one.“It is a pleasure that cannot easily be matched, the care taken by art departments, impossible in a faster moving medium, and the sense of a club feel… you feel yourself attractively badged and comfortable.”He thought people were mesmerised by rise of digital, but conceded that its triumph was inevitable, adding: “But I do think the magazine industry will survive for a very long time to come, possibly in a slightly contracted form”.Condé Nast publishes 124 titles worldwide with 54m readers. Some 90% of its profits come from its printed magazines with the remaining 10% from digital. Although the company’s magazines are available on an iPad, said Coleridge, “I wouldn’t say that there’s a huge rush”.